Last three months, the Leader of Indigenous people of Biafra declared a public holiday and strictly directed that all major shops be closed in Biafra land; which is the old Eastern region. That order was adhered to and the public holiday was successful more than any public holiday ever held in history of Biafra and Nigeria. That passed a clear message; that there is a nation under occupation. While some interpreted it as resoluteness, I interpreted it as indication of existing willingness or determination. One thing that cannot be denied is the fact that it was a historic holiday. This same leader can declare another civil war or order armed confrontation and the people of Biafra will go about it in a historic way. Like that holiday was absolutely observed; this civil war will absolutely be observed and executed. Nigeria should thank their luck that Nnamdi Kanu is an exotic leader; one who studied in a civilized Country and acquired knowledge with which he has brought Biafra to a mainstream platform without a gunshot. Should Biafra eventually come to the point of gunshot; Nnamdi Kanu will still win like he has always won. If Buhari still claims that he controls old Eastern region; then he has to explain how the people observed public holiday and on whose order? One thing is very certain; in one way or the other, Buhari has gifted Nnamdi Kanu the people. There is visibly a political leader and Indigenous Leader and the power of Indigenous leader seems to be more effective than that of the political leader. Now this scenario has made the battle between this two a head to head one. One may be opportune to using the Military; Police and all the forces in Nigeria while the other uses common sense and freedom of speech for conviction. The leader that has access to the Military and Police has abused the forces; killing Indigenous People for embracing common sense. The arrest of the leader of Indigenous People of Biafra is the genesis of the battle; that is what the battle is all about because had he not been arrested, there won’t be opportunity for a close and effective battle. There is a place Buhari will win Nnamdi Kanu; that is Northern Nigeria, in the West, there might be split influence. What gave Nnamdi Kanu power is truth and ability to reason while constitution gave Buhari power. It can be argued that Buhari will triumph in the North because Nnamdi Kanu has no interest there. What this has shown is that there are two leaders; indigenous leader and political leader. They vary in their capacity, reasoning, approach and structure. 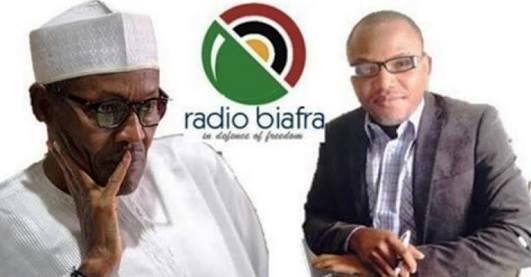 Nnamdi Kanu is reason oriented while Buhari is an odd product of politics. Buhari holds a position; he has severally noted that Biafra will not be restored; saying that the people asking for Biafra did not see what happened to their fathers in 1967, positing had they experienced the genocide against them, they won’t be asking for Biafra today. He has signaled his willingness to commit genocide again to make sure Biafra is resisted. He recently shifted a bit in his view when he said that to restore Biafra will be very difficult; he called on Biafra activists to stop activism and embrace Nigeria. Nnamdi Kanu on the other side vowed that Biafra will be restored; he made it clear that either death or Biafra and one will definitely prevail. He has refused all advances and plea for negotiation; he persisted on the conduct of referendum as the only solution to the Biafra question. In spite of his illegal arrest and continued detention; he could not be broken or swayed. He has kept or preserved his position that all he needs is Biafra and this is becoming a religion to him, making things harder for Buhari and his contractors. The two leaders have established their positions and only time will tell who triumphs; as long as Nnamdi Kanu is firm on his position, the battle will continue. On the side of Buhari; as long as he persists that referendum will not be called and forcing one Nigeria on Indigenous People of Biafra, the war will continue. This makes time the umpire of the battle; time will eventually tell who wins or loses and while time slowly make its assessment; let us look at the particulars of possible victory for either of the leaders. Buhari is standing with the Military while Nnamdi Kanu is standing with the people and hence this is a democratic dispensation; Nnamdi Kanu is on his way to victory. There is never a way one man with few military can stand millions of Indigenous People. I have made it clear that gun cannot do anything to an ideology; while Buhari is shooting, let us pray Indigenous People defend not which will snowball into a full blown crisis. UN 2007 declaration on the rights of Indigenous People backed Nnamdi Kanu whilst 1985 UN human rights declaration is entirely against the actions of Buhari. By clear assessment; Nnamdi Kanu has the legal particulars to triumph or come out of the ring a victorious one. Buhari is fighting time as it is already clear that he has lost the battle. Globalization is another factor that will ensure victory for Nnamdi Kanu; as referendum is going on all over the world to determine the fate of people which entirely castigates the approach of Muhammed Buhari who has instead launched military action; there is conviction that time will overtake Buhari and nemesis will strike. It is either referendum is allowed to hold in line with globalization/international laws or Buhari will not only lose but face the wrath of the law in the end.